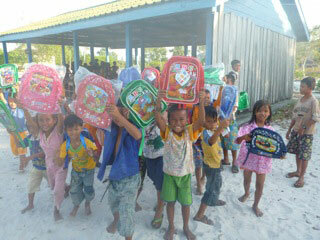 In the village of Prek Svay, on the island of Koh Rong, it sometimes takes only a little to make a difference! With the humble schoolbook, pen and bag being a notable financial commitment, even for the average family, it is gratifying to see what a change these materials, supplied through the Pack for a Purpose initiative, can make to the lives of local children. Working this way – nurturing the capacity of local communities – lies at the heart of Song Saa’s soul and spirit. A luxury resort, in the Koh Rong archipelago, we are the first five-star development in the region. Given this we have taken seriously the responsibility of ‘treading lightly’ and ensuring that we work to improve the lives of those around us. In this quest, Pack for a Purpose has been a perfect partner, offering a means for our guests to join with the resort’s efforts to help our nearby neighbors. So simple! Yet so effective! These materials are very useful for the students, because if they have enough books and school materials they will feel more confident, and they will pay more attention and study harder. 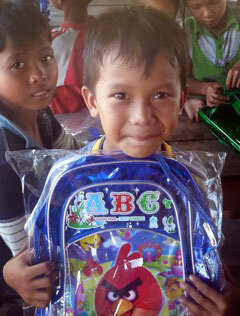 For lower school pupil Phorn Srey Own, a recent gift of a school bag was particularly exciting. I am very happy when I received the school bag; now I can bring all of my books to class and I do not have to worry about them getting wet or dirty. It is also good for my family, as I do not need to ask money from my parents to buy new things for school. So my parents can use this money to buy food and medicine for our family. Comments from our guests reveal that the benefits of participating in Pack for a Purpose do not stop here. Several have recounted how the process of deciding what to bring and then purchasing it has helped them to appreciate the everyday needs of those in a developing country. 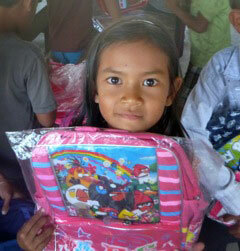 Which goes to show that Pack for a Purpose is more than a way of helping; it is also a way of thinking – a way that perfectly aligns with our philosophy at Song Saa Private Island.